In order to share with you, through real data, the great qualities of Cassandra DB, we bring you here some graphs that represent to the best the difference in terms of performance between Cassandra and other NoSQL Databases and we explain those that are the advantages related to the use of our platform for the management of Big Data, Isaac. In this first performance test of different NoSQL DB, a combination of 50% of read operations and 50% of edit operations have been made. As is clear from the graph, increasing the number of nodes, the number of operations per second of Cassandra grows exponentially. 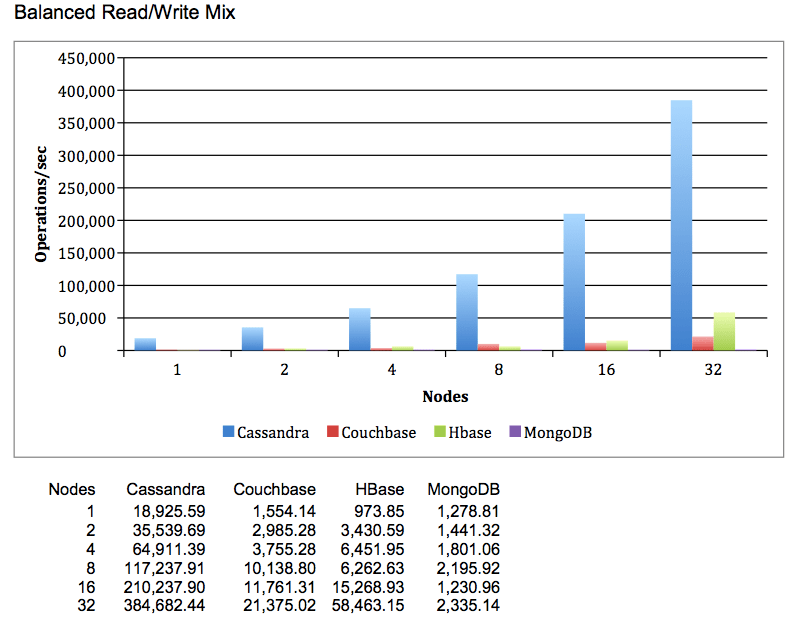 This does not happen for what concerns others NoSQL DB taken into analysis. In this second test, a combination of 50% of read operations and 50% of read-edit-write operations have been carried out. In this case too, increasing the number of nodes the number of operations per second of Cassandra grows exponentially. In this last test, a combination of 90% write operations and 10% of read operations have been made. Again, the results obtained for the previous tests are confirmed. As far as other tests on data entry speed on Oracle and Cassandra are concerned, the results have shown that Cassandra achieves up to 20 times better performances than Oracle. On a sample of 400 million profiles, Oracle has been able to insert 2.5 million of them per hour, while Cassandra has been able to enter 125 million profiles in the same time frame. 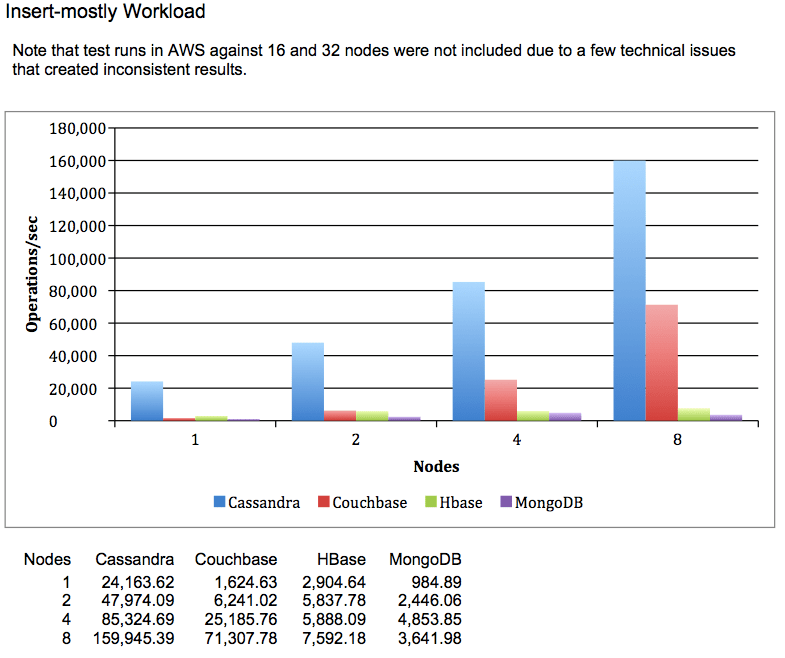 These data show, again, the improvement of Cassandra performances as the amount of data increases. The results are even more astounding if, in conjunction with Cassandra, it is used Apache Spark, framework for distributed computing, 100 times faster than Hadoop, Map Reduce and 10 times faster on disk. The performances of these two technologies are 50 times better than Oracle’s. And it is on the basis of the Apache technologies Cassandra and Spark and evidence about their excellent performances that we chose to build Isaac: Our platform for management of Big Data. Cassandra and Spark provide a distributed environment that, in addition to ensuring high reliability thanks to data replication, allows you to have an easily scalable system in which, to increase performance, you only need to increase the number of nodes. Isaac offers easy and immediate access to your Big Data, thanks to an installation process of only 15 minutes instead of 7 days. This platform does not require user-specific knowledge of NoSQL. It is based on Cassandra and Spark technologies, and has been developed to drastically simplify their use to those who do not have experience in Big Data field. Isaac is simple: the web interface is aimed at helping the user in every operation. Lean and intuitive, it will guide you inside Big Data world, offering explanations on new concepts and terms and giving practical advices and suggestions (an help section summarizes and explains terms and concepts to those who are fledgling with the management of big amount of data). Click here to arrange a Live Demo of Isaac: one of our experts will show you all the functionality of the platform and will be at your disposal for any requests, clarifications or curiosities. Your Big Data environment, in few, simple steps.